Have a welcome retreat from the pressures and stress, and give yourself ‘A Latitude Attitude'! This beach retreat allows everyone to enjoy the beach. . .including the family dog. It's a short walk to the beach access, or enjoy your own private pool and hot tub. Family activities are close by including the Wright Brothers Memorial, mini golf, laser tag, and lots of dining options! A great layout invites you to spread out and relax. Decks on the Oceanside allow for ocean breezes while relaxing. Want a faster pace? The roomy ground level den has a foosball table, wet bar and a mini-fridge, also convenient for poolside drinks. The screened porch just off your private pool offers a cool and shaded spot to watch the kids playing in the pool. ‘A Latitude Attitude' is centrally located so shopping, restaurants, movies and activities are just minutes away. Top-Level: Great Room with 55” LCD TV, Surround Sound, Gas Fireplace, Partial Ocean View from Deck, Kitchen with Bar seats 4, Dining Table seats 6, Hall Bathroom, King Bedroom with LCD TV, DVD. Mid-Level: Bedroom with Bunk Bed and Full Bed, LCD TV, and Deck Access; Queen Master with LCD TV and Deck Access; King Bedroom with LCD TV; Hall Bath, Laundry with Washer/Dryer. Ground-Level: Rec Room/Den with Futon and Wet Bar, Mini-fridge, Foosball, Half Bathroom, Screened Porch with patio set with Access to Pool Deck, Covered Parking, Private Pool and Hot Tub. Extras: Private Pool (12 x 24), Hot Tub, Wireless Internet Access, DVD players, Foosball Table, Gas Fireplace, Gas Grill, Screened Porch, No Smoking, Dogs Allowed, Parking: 4 Cars, Milepost 5, Distance to the Beach: 1105 ft.
Have a welcome retreat from the pressures and stress, and give yourself ‘A Latitude Attitude'! This beach retreat allows everyone to enjoy the beach. . .including the family dog. 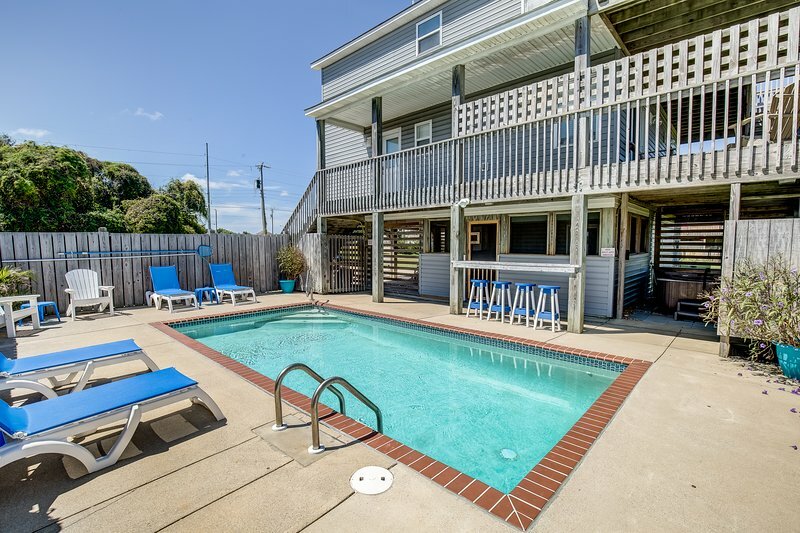 It's a short walk to the beach access, or enjoy your own private pool and hot tub. Family activities are close by including the Wright Brothers Memorial, mini golf, laser tag, and lots of dining options! A great layout invites you to spread out and relax. Decks on the Oceanside allow for ocean breezes while relaxing. Want a faster pace? The roomy ground level den has a foosball table, wet bar and a mini-fridge, also convenient for poolside drinks. The screened porch just off your private pool offers a cool and shaded spot to watch the kids playing in the pool. ‘A Latitude Attitude' is centrally located so shopping, restaurants, movies and activities are just minutes away. Top-Level: Great Room with 55” LCD TV, Surround Sound, Gas Fireplace, Partial Ocean View from Deck, Kitchen with Bar seats 4, Dining Table seats 6, Hall Bathroom, King Bedroom with LCD TV, DVD. Mid-Level: Bedroom with Bunk Bed and Full Bed, LCD TV, and Deck Access; Queen Master with LCD TV and Deck Access; King Bedroom with LCD TV; Hall Bath, Laundry with Washer/Dryer. Ground-Level: Rec Room/Den with Futon and Wet Bar, Mini-fridge, Foosball, Half Bathroom, Screened Porch with patio set with Access to Pool Deck, Covered Parking, Private Pool and Hot Tub. Extras: Private Pool (12 x 24), Hot Tub, Wireless Internet Access, DVD players, Foosball Table, Gas Fireplace, Gas Grill, Screened Porch, No Smoking, Dogs Allowed, Parking: 4 Cars, Milepost 5, Distance to the Beach: 1105 ft. Additional amenity details: Private pools are open from May 3, 2019 until October 13, 2019. This property is not equipped for pool heat. Pool heat is not an option for this property. Hot tubs are available from March through December. Gas fireplaces are shut down from May 17, 2019 until September 15, 2019. All Outer Banks Blue properties provide bed linens, bath towels, beds made prior to your arrival, and a starter supply of: toilet paper, bathroom soap, paper towels, and dishwater detergent. Discounted H2OBX Water Park tickets available when you book with Outer Banks Blue.